I don’t watch Meet the Press or television journalism, so I didn’t recognize David Gregory’s name when his memoir appeared on my desk. The title, however, caught my attention. How’s Your Faith? – An Unlikely Spiritual Journey is a courageous testimony by an adult child of intermarriage, whose own interfaith marriage sparks his spiritual journey. Raised with a Jewish identity, he marries a devout Christian only to realize that his relationship with religion, and ultimately with himself, needs attention. 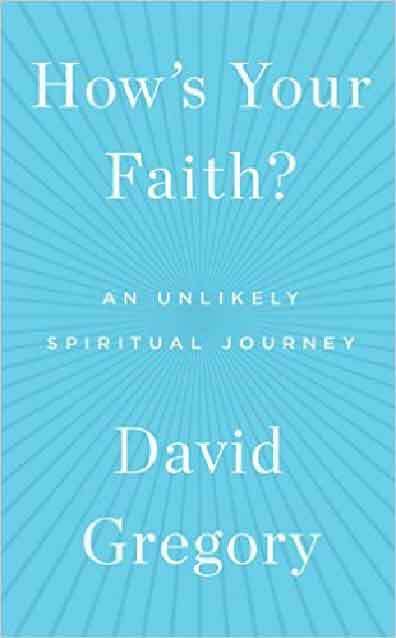 As in many memoirs, David’s personal life propels his spiritual search. When he shares how he rose and fell at NBC, he learns “humility.” When he confronts memories and feelings about his mother’s alcoholism, he grows in “forgiveness.” When he reminisces about encounters with then-president George W. Bush, he experiences “transformation,” and so on. Along the way, he interviews Jews, Muslims, Christians, atheists, rabbis, ministers, and a cardinal. All the while, he brings his skills as a journalist, raising questions, seeking answers, citing sources, sharing insights, and in the process, finding faith. Jewish practice may be the road he chooses, but he learns that detours must suffice. In the end, his noble quest is not to be a better Jew, but to be a better person by strengthening his relationship with God. Ironically, the chapter about “Sacrifice,” which had me marking its pages, was not so much his as his wife’s. When Beth agrees to raise their children Jewish, it is she who gives up her religion (not her faith) in order for David to find his. They join a Temple and send the kids to religious school. David may be choosing the route, but Beth knows the destination. She is the welcome “guiding hand” behind his growth from the particular to the universal, from religion to spirituality, and belief to faith. More of her personal experience would have been appreciated. David reflects on the evolution of his faith when he writes, “Before I could embrace the more universal lessons of faith, I first needed to delve deeply into the specifics of Judaism.” Such awareness may come only in hindsight, but it’s worth noting. The future of religious education may not rest with identifying as Jew or Christian and may even backfire if that’s the goal. David admits that his children lack enthusiasm for their religion and implies it is because “the Jewish education system is flawed” and “Judaism is more abstract and intangible than Christianity.” But if religious education, for adults or children, stops with a narrow sense of identity, spiritual growth and faith formation may be stunted. Interfaith marriages, and I’d argue interfaith education, are prescriptions for developing faith. David Gregory’s honest account makes the conversation not only permissible but gratifying. By the way, how’s yours?